It’s ugly, but it’s true: when a Washington power player looks set to fall, the capital drools. So Treasury Secretary Timothy Geithner found himself the object of intense interest when he came before the House Ways and Means committee to testify Tuesday. It was his first major public appearance since his less than inspiring rollout Feb. 10 of a half-baked plan to save banks that left Washington and Wall Street whispering that Geithner, 47, wasn’t ready for prime time. For all Washington’s conviction that perception is reality, Geithner’s fate rests less with how he performs in public than how his plans fare: the market and most Americans care a lot more about the substance of the Administration’s efforts to save the economy than they do about Geithner’s thin delivery. Sure, he doesn’t seem to fill his suit, and he talks too quickly, and he swallows the ends of his sentences, and he gives the impression of a grad student taking an oral exam, not leading the country out of perdition. But he’ll be the hero of the western world if his plan to subsidize the sale of toxic assets leads banks back from the brink. On that score, of course, the jury is still out. Geithner and the Administration have resisted outright nationalization of the banks because of the cost, complexity and political hazards of doing so. Instead, they are trying to get the market to price the incredibly complicated mortgage-backed assets that are suffocating the economy by paying part of the cost for private investors to buy them off the banks’ balance sheets. At the same time, the Federal Reserve, whose chairman Ben Bernanke took his own public flogging on Capitol Hill Tuesday, is unveiling an aggressive plan to stimulate consumer, small business, auto and college borrowing, an area of the economy that has in large part been frozen since the fall. Which is not to say appearances don’t matter at all. Geithner was chosen as Treasury secretary over the rough-edged but more experienced former Treasury chief Larry Summers in part because Geithner was considered a smoother salesman. And Geithner will always be saddled with the hard-to-explain $34,000 tax shortfall that almost cost him the nomination. Congress is already unhappy with the vast sums of money the government is plowing into financial sink-holes like Citigroup and AIG that have been deemed too big to fail, and Geithner may have a hard time convincing it to pony up hundreds of billions more if necessary, as he himself said Tuesday it might be. 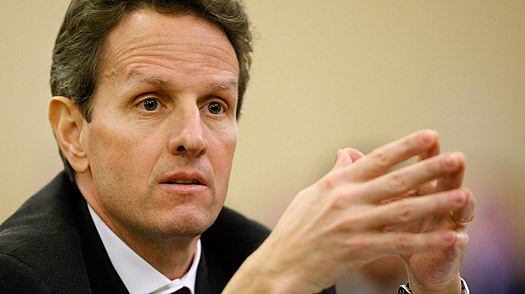 When the Administration rolls out its more detailed bank bailout plans in the next few weeks, Geithner will have another chance to salvage his reputation as a salesman. But the truth is, if the plans fail on their own, it won’t be Geithner’s tone of voice or his demeanor that brought him down, no matter what the Washington crowd may say.